The rate per capita of preventable paediatric presentations to hospital emergency departments (EDs) has risen steeply over the past 12 years, resulting in significant policy and resourcing implications, both in Australia and overseas. In Melbourne, there is concern that already overburdened paediatric emergency services will not be able to meet the needs of the expanding paediatric population, particularly in the north-western growth corridor. These concerns prompted an AURIN-empowered pilot research project, led by Associate Professor Lena Sanci from the Department of General Practice at University of Melbourne, which examined service delivery in primary care as one potential method for reducing non urgent presentations to EDs. One key aspect of the project was to understand the other major elements which impact on ED demand, outside the scope of primary care service delivery. In particular, uneven distribution of primary health care services in areas of recent population growth and other aspects of the built environment and transport network which have significant impacts. With this in mind, the researchers set out to first determine why parents take their children with low-urgency conditions to EDs, and what improvements to service delivery need to be made to reduce these ED presentations. 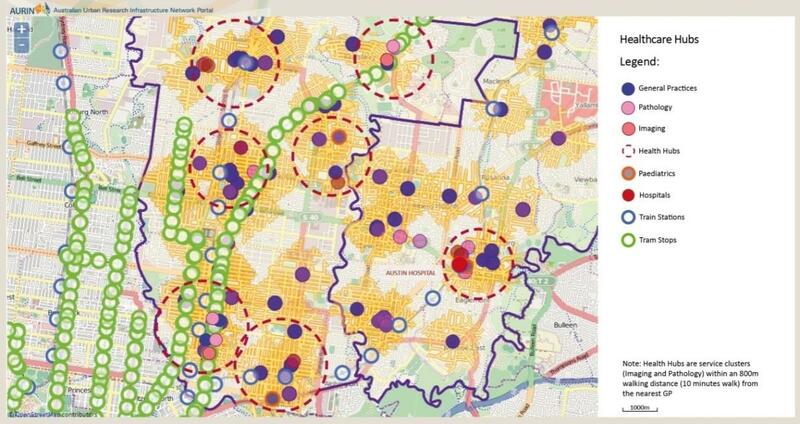 The Australian Urban Research Infrastructure Network (AURIN) contributed significantly to the project, through data provision, visualisation, and analytics. Firstly the researchers mapped the services and population to understand the geographical location of primary care and hospital services relative to the paediatric population, through collaboration with the AURIN. The research team were able to use AURIN’s data and analytical resources to identify ‘healthcare islands’ that had reduced access to medical services and were within walking distance of train/tram stops. Mapping enabled by AURIN showed that health service hubs predominantly cluster around main roads near hospitals, with considerably fewer health services located in residential neighbourhoods. Local health services offerings were often limited to Maternal Child Health Centres (MCH), General Practitioners (GPs), and pharmacies, with only a few GPs offering extended hours inside the neighbourhoods. Hence many parents may not have viable alternatives to presenting to the ED, particularly out of hours. 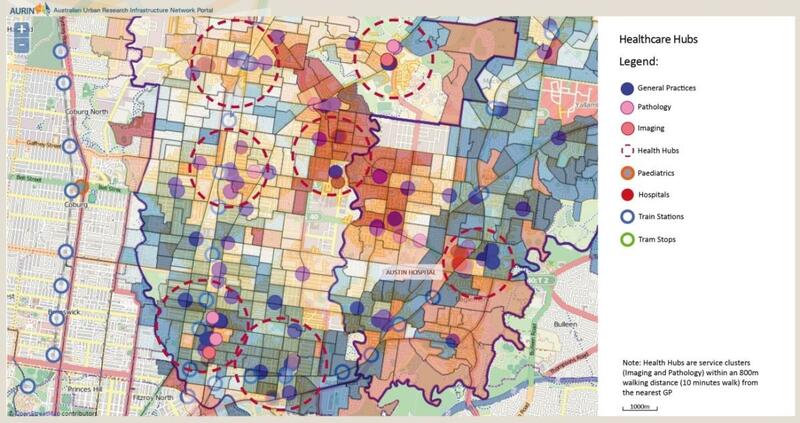 The spatial analytics undertaken by AURIN showed that there was a high concentration of GPs in the Hume-Darebin-Banyule corridor, with much lower accessibility in the outer suburbs. Low GP access rates were found to correspond with high social disadvantage indices in a number of areas such as Broadmeadows, Craigieburn and Roxburgh Park. Residential areas inside the suburbs away from arterial routes are also more isolated from faster public transport options (train and tram), rely on bus services (reduced frequency and operating hours), and represent higher rates of car dependency. The research team also used AURIN to identify projected population growth zones for the Local Government Areas (LGAs) within the study areas, which showed that the areas with substantial ‘health islands’ and high rates of socio-economic disadvantage were also the areas with highest predicted growth in the 0-9 year old population. Assoc. Prof. Sanci’s team showed that the reasons parents choose to attend ED rather than primary care for low-urgency primary care sensitive conditions are many and varied, but include geographic elements. One of the researchers’ primary recommendations was the importance and need for considerably more work intersecting health care and service provision with urban planning. Accessing more information on methods of access to services such as transport modes, the location of new residential developments. As a direct outcome of this research, AURIN has been able to secure access to the NHSD service location data for use through the AURIN portal. Need health data for your research?